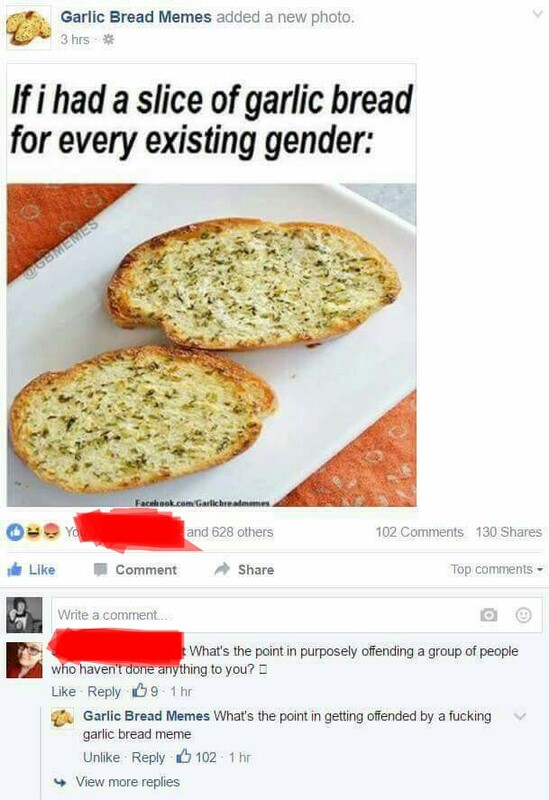 A war is brewing in memedom, and it could not possibly be more absurd: In the various online fan groups devoted to garlic bread, fierce arguments have broken out over… gender. The implication, many readers assumed, is that the page’s administrators rejected gender identities beside male and female. And that promptly ignited hundreds of outraged posts in the comments, as well as on Reddit and Instagram, where the meme is similarly well-followed. Critics were aghast that a slice of bread would take such a position. Before we get any further into the drama, we should probably take a baby step back and survey what it is that we’re actually talking about. 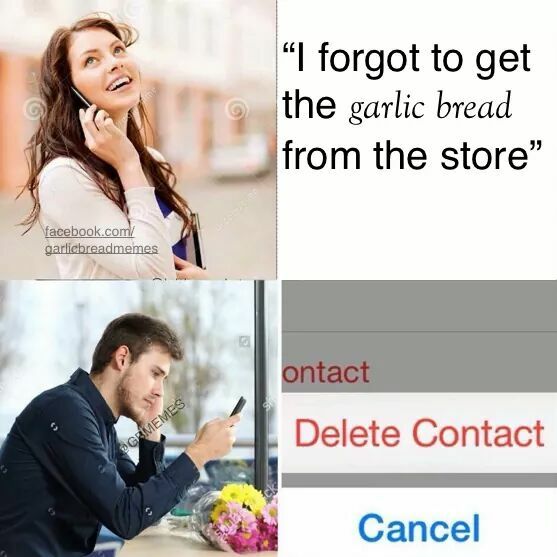 Offline, garlic bread is a food — okay, sure. But online it’s sort of like that juvenile joke where you append the phrase “in bed” to your fortune cookies. It doesn’t stand alone, really — it’s an addendum to existing memes, a means of making any prior messages absurd and thus, funny. The absurdity is an end in itself: It’s not necessarily an attempt to communicate any broader point or commentary, unless you’d call it a parody of meme culture in general. In other words, people who follow Garlic Bread Memes — whether on Facebook (265,000 subscribers) , Reddit (11,000) or Instagram (10,500) — find it funny because it makes fun of memes that exist already. 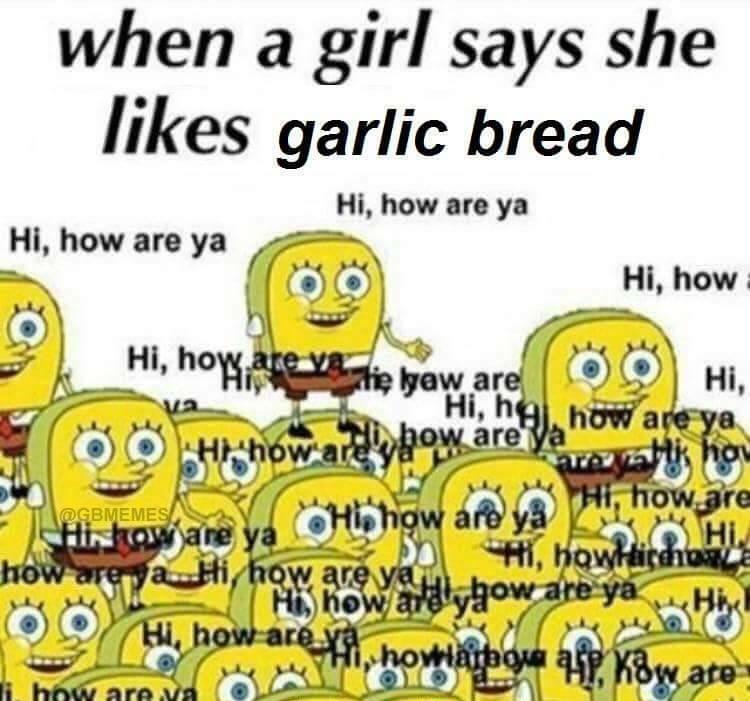 In the case of this latest and very infamous garlic bread meme, the original source was an explicitly transphobic image macro that makes regular appearances in places like 4chan and r/The_Donald, Reddit’s dedicated Trump fan club. Usually it reads something along the lines of “if I had a dollar for every gender, I’d have two dollars,” or “if I had a book for every gender there was, I’d have have Donald Trump’s “Think Like a Champion” and “The Art of the Deal.” Boaz says he was specifically inspired by a less-than-tasteful iteration that reads “If I had an atomic bomb for every gender there was” next to a map of the 1945 bomb strikes in Japan. 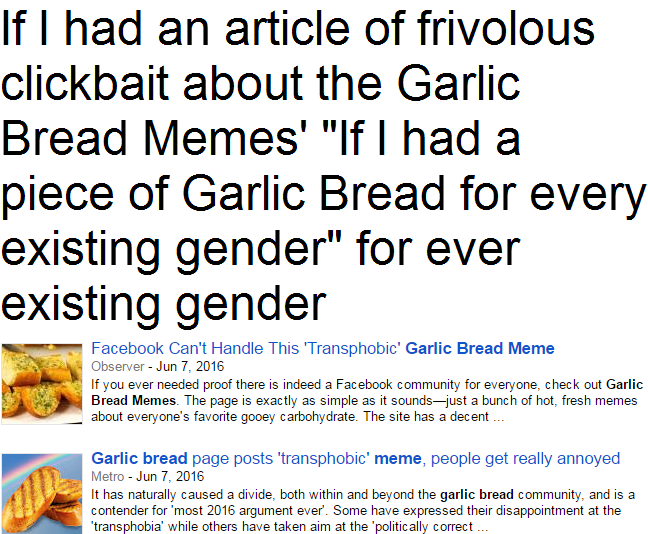 But remember that garlic bread memes are intended to make absurdities of the originals they depict, which means that Boaz was basically mocking a transphobic meme with his breadier version. At the same time, he expected it to offend “social justice warriors,” a derogatory name for people who speak out on progressive issues. So Boaz was, essentially trolling everyone involved in the online gender debate. He wasn’t mocking trans people, Boaz told Intersect: He was mocking the extremes of the online conversation that happens around them. But we will say that, insofar as the meme was originally intended to mock the state of online dialogue, it definitely worked. Just look at any of the more than 2,000 comments that have been left on the macro: People on both sides — particularly the anti-trans side, who seem responsible for virtually all of the comments — are going absolutely berserk. They’re calling names; typing in all caps; launching into lengthy diatribes that misquote the scientific literature. Any commenter who questions the gender binary is promptly slapped with a hail of f-bombs and ad-hominems. Boaz would argue that’s exactly the joke: Online outrage culture has blown up so much, he says, that it needed garlic-breading to make evident just how extreme it had grown. Of course, in an ironic turn of events, the garlic bread became an object of outrage itself. …All of which leaves us with a vague sense of despair and a desire to never again eat garlic bread again.